If I had lived in the 1950s, I might have asked my husband for a fur coat for winter. Now, in the 2010s, I am asking him for a root cellar to store the bounty from my garden over the winter. He has not given in yet but I’m working on it. Citron melons are supposed to keep well into the New Year. However, lacking a suitable cold storage, I had to tackle them within weeks of harvesting them. 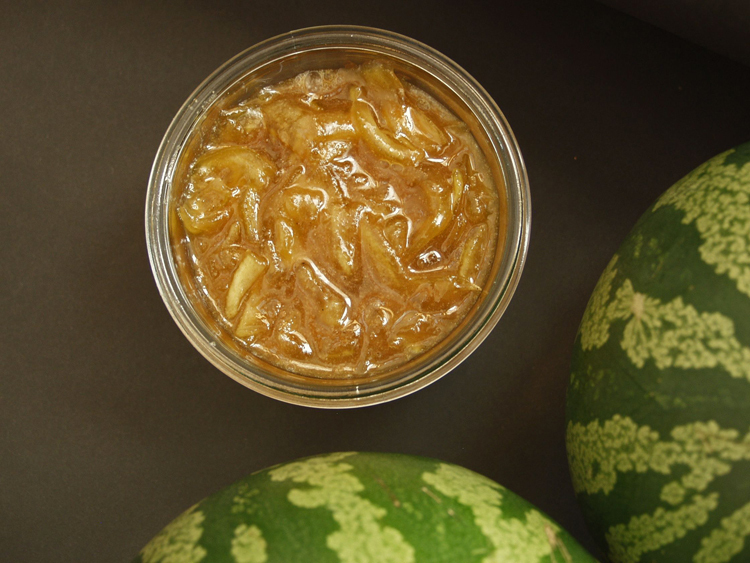 In all five recipes, letting the melon sit with sugar and condiments long enough is crucial, as the melon needs time to release a lot of liquid and absorb the flavors. I adapted this recipe from a French blog. The jam has the consistency of marmalade. I find it especially good in sweet and savory combinations. So far I had it with hard cheese and blue cheese. I think it is also good with cold cuts, pâté or other charcuterie. 1. Coarsely grate the melon in the food processor or by hand. 2. Wash the orange under running hot water and dry it thoroughly with paper towel. Zest it and finely chop the zest. Cut the orange in half horizontally and scoop out the flesh with a grapefruit spoon, avoiding any of the bitter white pith. 3. Tie the star anise in a small piece of cheesecloth. This will save you fishing for the pieces later. The jam requires a lot of stirring and chances are that the star anise will break apart. Split the vanilla bean open. 4. Mix the melon, orange zest and flesh, star anise and vanilla bean in a non-reactive container with a lid. Cover and let stand for at least 12 hours or overnight. 5. The next day, put the mix in a heavy pot and slowly bring to a boil. Do not pour off the liquid. Turn down the heat to low to medium and cook until the melon is translucent and liquid turns into thick syrup, about 45 minutes. Stir every few minutes at the beginning, almost constantly at the end. Be careful not to overcook it, or you will caramelize the jam. 6. Remove the star anise and vanilla bean and stir in lemon juice to taste. 7. Ladle the piping hot jam into sterilized jars. Wipe the rims with a damp piece of paper towel to remove any drips. Place the lids and bands on the jars and process in a boiling water bath for 10 minutes. 8. Remove from the water bath and let cool and set for 24 hours without disturbing the jars. After the rather mellow jam with orange, I wanted something with more zing, which this one definitely has. 1. Finely dice the melon and mix it with the sugar, lime zest and ginger in a non-reactive container with a lid. Cover and let stand for at least 12 hours. 2. Proceed as described in Step 5 of the previous recipe, finishing the jam with lime instead of lemon juice. Process in a boiling water batch as described in Step 7 and 8. Adapted from a recipe by Sand Hill Preservation Center, a seed company that actually offers several citron melon varieties in its catalog. This is the recipe that I am the most excited about because it supplies me with a homemade substitute for candied lemon peel, a common ingredient in German Christmas baking. 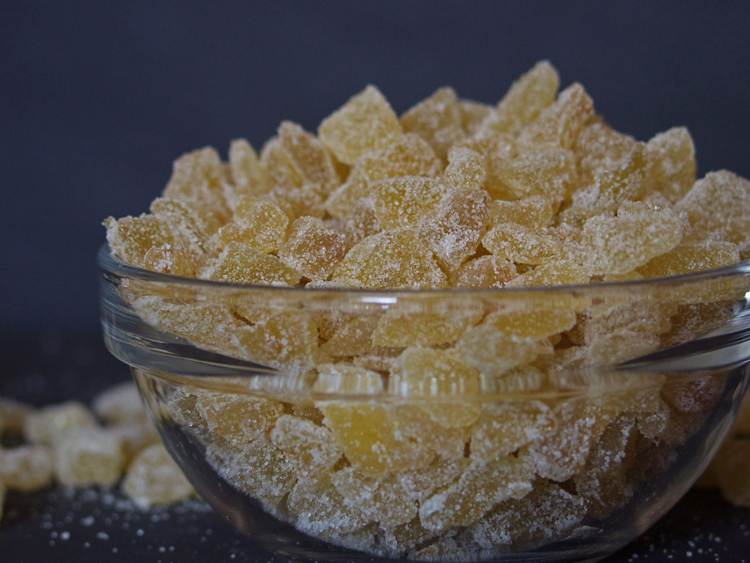 The usual store-bought candied lemon peel contains high-fructose corn syrup. 1. Cut the melon into ½-inch cubes. 2. Bring 1½ cups sugar and 3 cups water to a boil. Add the melon and cook for 20 minutes. Remove from the heat, cover, and let stand overnight. 3. The next day, drain the melon. Reserve 1 cup of liquid and discard the rest. Pour the reserved liquid back into the pot and add 1½ cups sugar, the lemon juice and peel. Bring to a boil, add the drained melon cubes and cook until most of the liquid is absorbed and the melon turns translucent, stirring often. Be careful not to overcook it, or it will caramelize. 4. Place the melon cubes in a colander and drain well. 5. Put some sugar onto a plate and have more sugar stand by. Line 2 to 3 cake racks with wax paper. 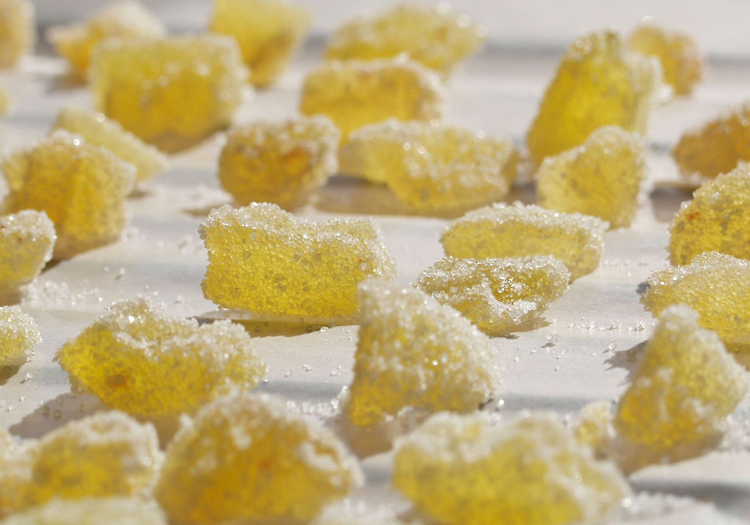 When the cubes are cool enough to handle, roll each piece in sugar and place it on the wax paper. Work quickly; if you wait until the melon is completely cooled off, the pieces will stick together and be difficult to handle. 6. Let dry for several days in a cool place free of dust and cooking fumes. Store in an airtight container or jar in the refrigerator. When I asked a friend who visits Italy often whether she had ever heard of citron melon, she said no, but citron melon sounded like something that would be used for the Italian condiment Mostarda. Right she was! There is indeed Mostarda di anguria bianca (Mostarda with white melon), and the melon looks similar to citron melon. I could only find the finished product and no recipes so I adapted a recipe for Mostarda mantovana, a variation from the city of Mantova that is made with fresh fruit, not with candied fruit like the more common Mostarda cremonese. I did not process the Mostarda in a boiling water bath because I felt it was not acidic enough for safe canning. 1. Cut the melon into thin slices. Mix it with the sugar in a large pot. Cover and let stand for at least 12 hours or overnight in a cool place. 2. Drain the melon over a bowl and pour the entire liquid back into the pot. Bring to a boil and simmer for 10 minutes. Remove from the heat and return the melon to the pot. Let cool, then cover and let sit for 1 day. 3. Repeat this process the next day, and let sit for another day. 4. The next day, slowly bring the mix to a boil. Do not pour off the liquid. Turn down the heat to low to medium and cook until the melon is translucent and liquid has turned into thick sticky syrup, about 45 minutes. Stir every few minutes at the beginning, almost constantly at the end. Be careful not to overcook it, or it will caramelize. 5. Remove from the heat. In a small bowl, stir the mustard with the vinegar until smooth, and add it to the mix while still hot. It seems like a lot of mustard at first, that is all right, Mostarda has a strong mustard flavor. Mix well. 6. Ladle the Mostarda into sterilized screw-top jars. Let cool and refrigerate. Use within a few weeks. The chunky, glistening consistency of the two jams looked like something that would work well to hold together a rich holiday pie filing – in other words, mincemeat. A pile of apples in the basement that were getting past their prime (did I say before that I needed a root cellar?) came in handy here. 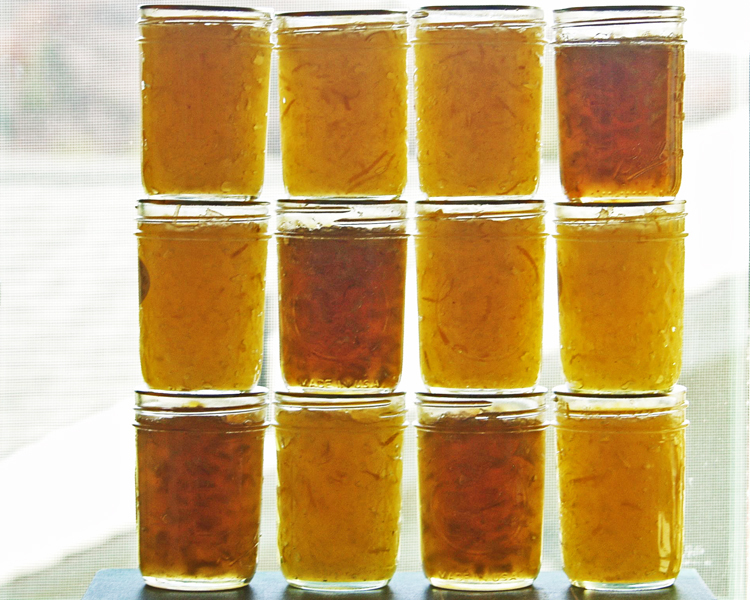 The original recipe called for orange marmalade, which I did not have so I substituted it with my Citron Melon Jam with Orange and Star Anise. 1. Mix all the ingredients except for the brandy in a non-reactive container with a lid. Cover and let stand for at least 12 hours or overnight. 2. The next day, put the mix in a heavy pot and slowly bring to a boil. Do not pour off the liquid. Turn down the heat to low to medium. Cook for about 45 minutes. The melon should be translucent, the apples very soft, and the liquid almost completely absorbed. Stir every few minutes at the beginning, almost constantly at the end. Be careful not to overcook it, or it will caramelize. 3. Remove from the heat and stir in the brandy. 4. Ladle the piping hot mix into sterilized pint jars. Wipe the rim with a damp piece of paper towel to remove any drips. Place the lids and the bands on the jars and process in a boiling water bath for 15 minutes. 5. Let cool and set for 24 hours without disturbing the jars. I remember the citron melons my Aunt and Uncle grew on their farm in southern Kentucky. Aunt Flora made pies with them. The pies were lemon like in taste but more pumpkin in texture. She must have used some eggs in them because she put meringue on them. The citron was also candied to be used in breads, sweet rolls and fruitcake. Her fruitcakes always had home dried fruit in them as well as hickory nuts and on a good year hazelnuts. The only bought fruit were the raisins . 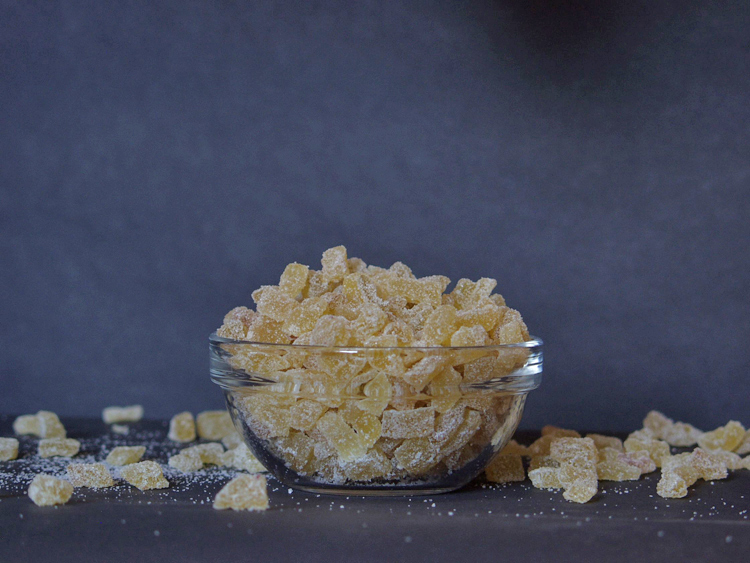 Around how long did you cook your citron the final time for the candied citron? After an hour mine are still covered with liquid, and I’m thinking of just draining them. I’m looking forward to using the citron in my German cookies (I mostly make Lebkuchen and Baslerleckerli), but I definitely recommend making one’s own candied lemon and orange peel as well–It makes the cookies taste *so* good! Nadia, thanks for the interesting ideas for using citron melons. How do you like the Citron Melon Mostarda, and what do you do with it? The mincemeat sounds really good; I can imagine it in a pie. I like the mostarda although I must admit I might have cooked it a bit too long, after a few days in the fridge now it is rather solid so it needs to come to room temperature before using it. It tastes a bit like chunky honey mustard. Lidia Bastianich has a great recipe for onions stuffed with pureed winter squash that uses mostarda, I haven’t made that in years because I never had mostarda; that dish will appear at our table more often this winter. Usually mostarda is eaten with cheese or boiled meat (bollito misto), of which I am not a big fan so I think I will use it also to flavor roasted chicken and salmon, it should give it a nice glaze.